With only an hour’s flight away, it’s almost a no-brainer to visit our more progressive neighbour, Singapore, for a boozy fix and whilst also fueling your mind. 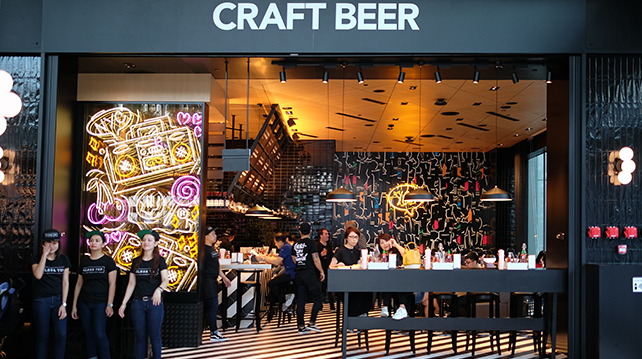 Singapore’s vibrant dining scene is attracting international brands to open branches on the island; it is also commonly the first point of export for beer and spirit brands around the world to reach the Asia market. The spending power of the islanders and their appreciation for finer things are undeniably the reasons for foreign investments. The sheer number of art and performing spaces, cultural sites and museums to visit, are always going to keep visitors busy, be it lone travellers or families. We didn’t say this is going to be a cheap getaway, after all, we are talking about Marina Bay Sands. But we guarantee great insta-worthy corners, food coma, drinks deals and insights about the ArtScience Museum to impress your mates while you are at it. For the fans of hip-hop, this list is also for you because we are going to zoom in to Marina Bay Sands’ latest F&B outlet - Black Tap, and this season’s latest luxury streetwear and accessories in line with the outlet’s hip hop theme. The New York born brand started only three years ago as a 15-seater burger joint in SoHo, and has quickly grown into 11 restaurants around the world this year. 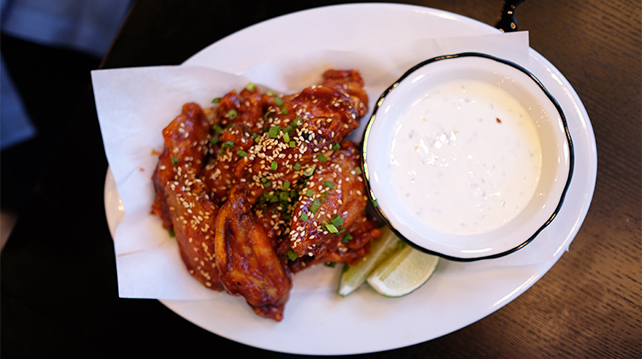 Open on 1 September 2018 in The Shoppes at Marina Bay Sands, the 133-seater luncheonette marks the first expansion of the brand to Asia (after creating success in the Middle East) with the menu featuring burgers from the classic All-American to The Vegan Burger, and offerings of salads, wings and sides. Get into the vibe of 80s and 90s hip hop and rock era with burgers, beers and the brand’s signature CrazyShakes. 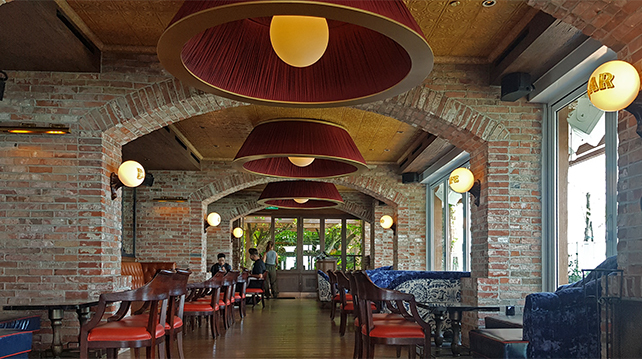 The luncheonette is located at the South Promenade of Marina Bay Sands, facing the financial district, ready to welcome any lunch crowd, after work dinner and anyone hungry for a juicy burger (from beef to chicken and vegan, they think about everyone!) or a pint of craft beer. 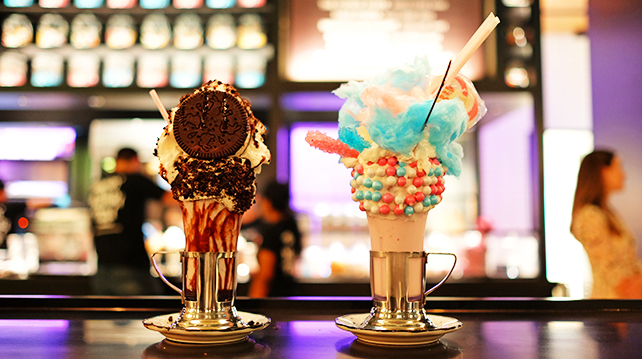 The ginormous milkshakes are not only going to give you a sugar high plus brain freeze, they are also great to hike up your Instagram engagements. 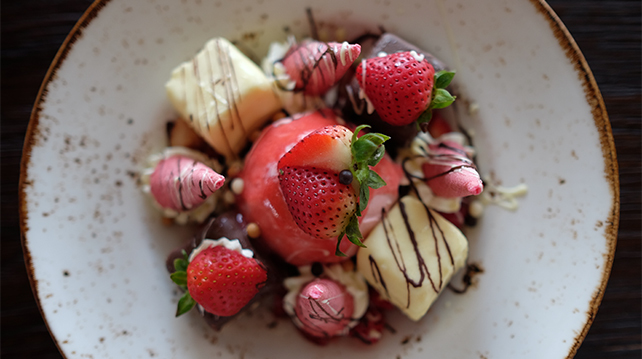 The 3-part restaurant is meant to be fun with its upbeat tunes and vibrant colours. 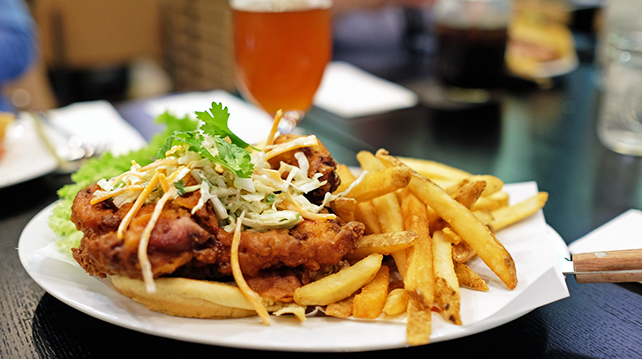 Their menu offers 13 types of burgers, 13 milkshakes and 20 craft beers on taps. There are also sides and salads, wines and non-alcoholic beverages. Address: L1-80, Bay Level of The Shoppes at Marina Bay Sands (South Promenade). Selfie spot: In front of “Black Tap Singapore” wall mural by graffiti artist Has. J; Neon sign at the Craft Beer section. In partnership with Marina Bay Sands, Lavo Singapore is the first Asian outpost for the TAO Group from the United States, after their expansion to Australia. The restaurant with its subway tiles and exposed brick walls is a venue for contemporary Italian American dining, offering lunch, dinner, wines and cocktails. Take the lift in Tower 1 all the way to the rooftop on the 57th floor and you’re transported back to 19th century pre-prohibition New York when there was an influx of Italian immigrants and their culture, mainly from the poorer southern regions. 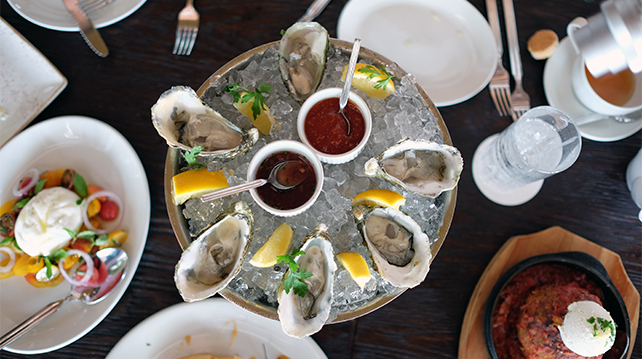 With plentiful meat and raw ingredients in the new land compared to their mainly vegetable-centric diets, “Italian-American” cuisine was born, with supersized servings that reflected their excitement in the abundance of food. 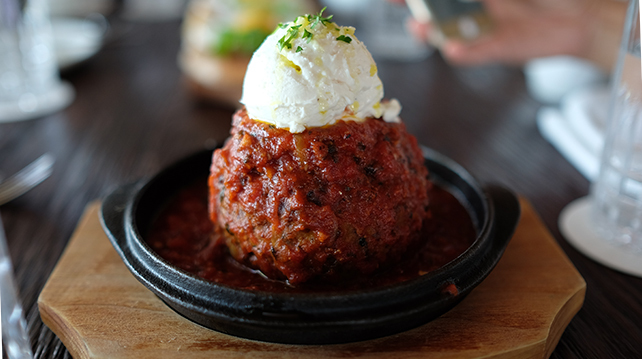 Lavo raises the bar with its luxurious setting, serving Italian-American classics like their signature Lavo meatballs and red sauce, pizzas, pastas, tiramisu, cappuccino, wine and spritz on their menu. This is probably the most instagrammable F&B outlet in the building. The C-shape layout offers an indoor dining area, a stylish lounge and outdoor garden terrace with an adjoining rooftop bar that promises an unobstructed view of Marina Bay and Singapore skyline. Choose from the main dining area with natural lighting that comes through the floor-to-ceiling windows, round leather booths with blue velvet coating, zinc bar top made and flown in from Paris, and sprawling wraparound outdoor garden terrace with a rooftop bar. This outlet probably gives the best value for your money. 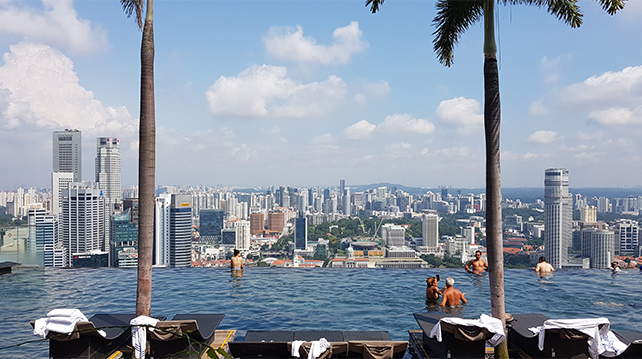 Club55 was originally only open to Marina Bay Sands hotel guests, but you would be delighted to hear that from 1 September 2018, this has all changed. Common people like you and me can walk in to the outlet from 8pm onwards and enjoy the night view of the city and carefully curated tasting flights. 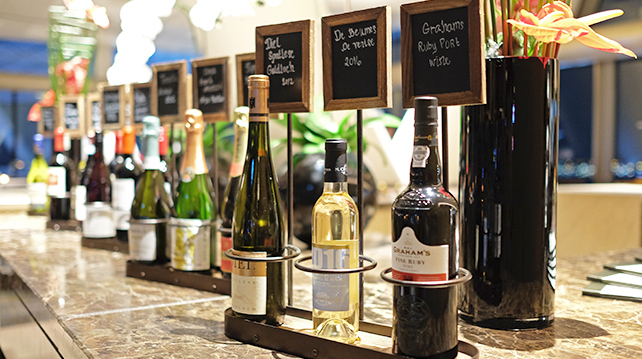 Tasting flights alone start from SGD15 for 3 mocktails (90ml each) and SGD18 onwards for beer, wine and sake (45ml / 60ml). 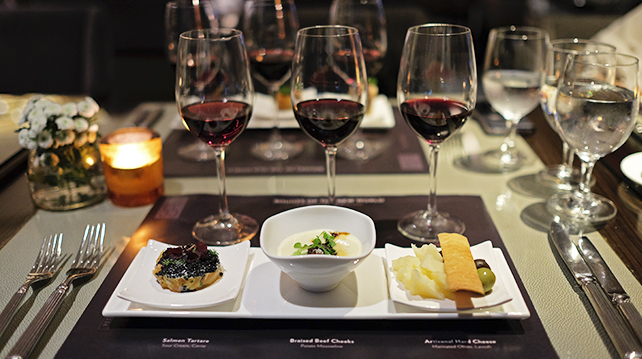 Pair with exquisite hors d’oeuvres from SGD44++ onwards. Address: Level 55, Hotel Tower 2, Marina Bay Sands, 10 Bayfront Avenue, #018956 Singapore. Selfie spot: Unless you want to take the reflection of yourself on the windows, we suggest you enjoy the view and have someone else take the picture of you enjoying your flights. The trend seems to be doodles this season - collaborations with artists by putting their artwork on the brands’ existing line, expressing their trend through designs and paintings on shoes. Puma Select is featuring several artists collaborations this season with Rihanna, who directed the entire range herself; Shantell Martin graphic sneakers; Tykasha Clyde’s fast food inspired graphics, and Russian designer Outlaw Moscow statement streetwear with block colours. If you’re a shoe collector, there is a shoe vault in Limited Edition Chamber that carries shoes as much as SGD7,000 a pair. 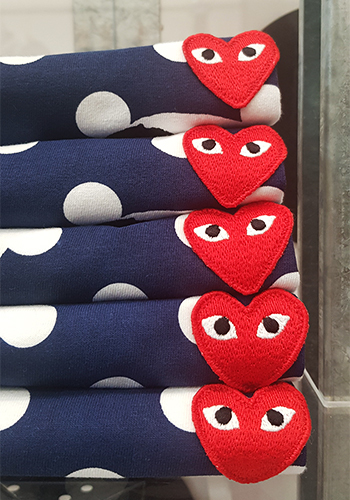 For those who love talented up and coming designer items, Club21 x PLAY COMME des GARÇONS is an iconic unisex multi-label concept boutique that provides some exquisite luxury clothing. The museum has brought about a major transformation starting from 1 September 2018, introducing 10 new digital artworks in four additional exhibition pieces to complement the existing 15 exhibitions. 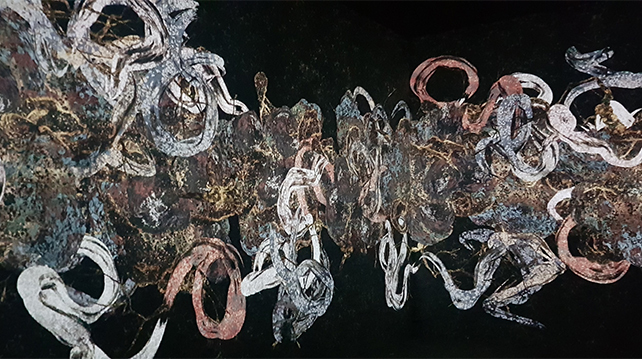 The new concept, Transcending Boundaries, is presented by teamLab through 6 artworks in the Nature gallery, 1 in Sanctuary and 2 in Park, all within the Future World exhibition. 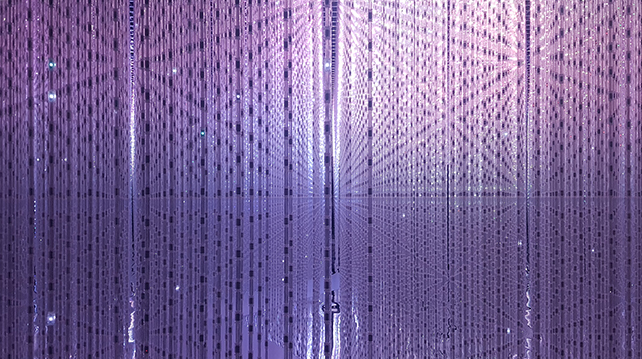 The entirely newly built space is an ever-changing art piece that interacts with visitors. The Nature Gallery comprises four walls of flowers, butterflies and waterfall together with features that reflect the results of the visitor’s movements. Watch flowers bloom around your feet, waterfall splatters around your body and butterflies fall from your touch. Sanctuary invites visitors to take a moment for reflection and meditation before experiencing how visitors’ presence affects and evolves the exhibition. The cherry blossoms bloom and scatter, like the cycle of life and death. The room brightens up as more people are creating shadows that darkens the space. Find out more about the museum here.